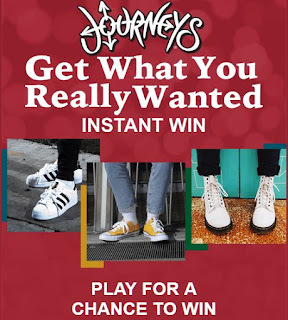 Journeys Shoes & Clothing $50 Gift Card Instant Win Giveaway - 48 Winners. Daily Entry, Ends 12/31/18. Short 5 day giveaway, GOOD LUCK!! Prizes (48): Each winner will receive a $50 Journeys e-gift card code (each a “Prize”).The approximate retail value (“ARV”) of each Prize is $50.